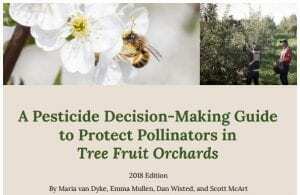 This comprehensive easy-to-use provides at-a-glance perspectives on best choices for protecting tree fruit crops while protecting pollinators. Other publications and future guides in this series can be found on the Cornell Pollinator Network Grower Resource Page. Come join the Cornell Orchards Store, Cornell Catering, and the Cornell Hard Cider Program Work Team for a family friendly Finger Lakes Cider Week event celebrating all things apples and cider! Starting at 1:00PM and 3:00PM, The Peck Lab will lead walking tours of high-density cider apple research orchards. There will also be hard cider tastings from local producers along with delicious food pairings, and of course plenty of apples and sweet cider from Cornell’s research farms to purchase and take home. 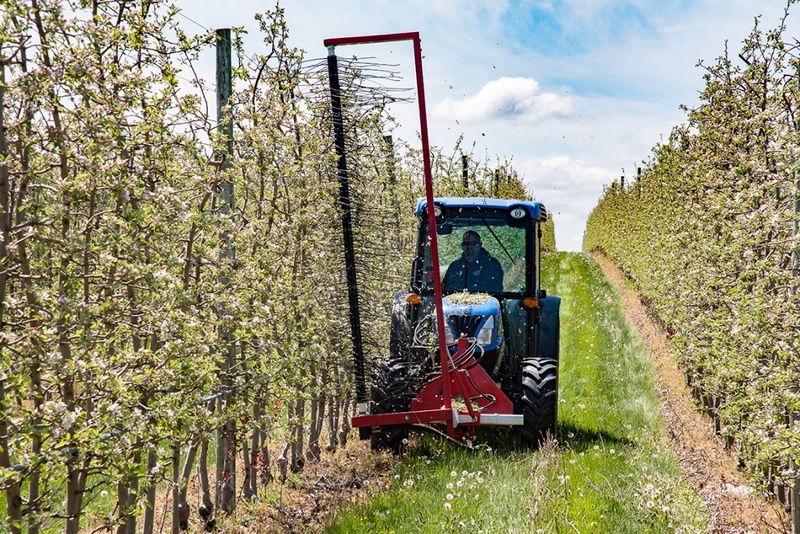 Jason Woodworth operates a tractor-mounted Darwin string thinning machine to thin apple blossoms on a fruit wall at the Lamont Fruit Farm in Waterport, New York. Lamont Fruit Farms participated in a recent Cornell study examining mechanical alternatives to chemical blossom thinning. Photo by R.J. Anderson/Cornell Cooperative Extension. For optimal yield and fruit quality, apple growers in the United States have long relied on chemical solutions to generate spring blossom thinning to promote the growth of larger, higher-quality fruit by giving them less competition for carbohydrate. However, in the last couple of years, one of the apple industry’s go-to thinning chemicals, carbaryl, has come under fire from some retailers, which are prohibiting the chemical’s use on produce sold in their stores. 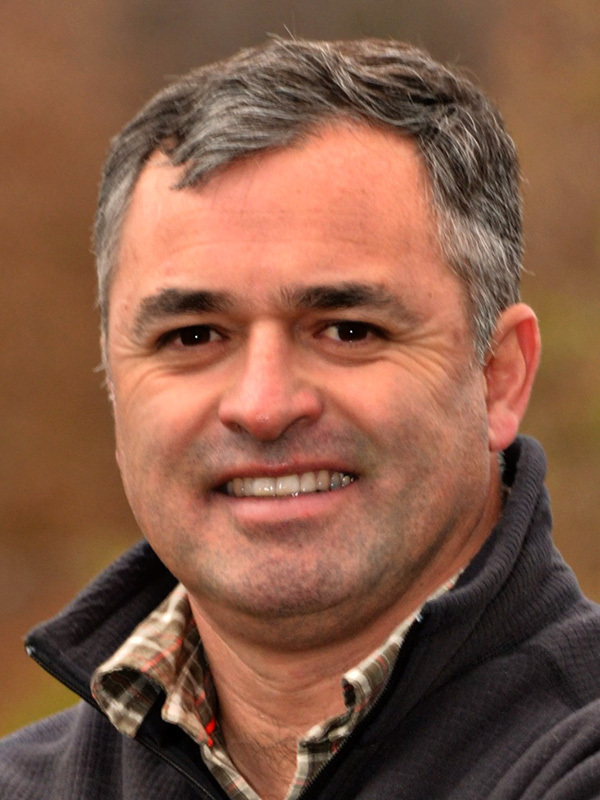 Equally alarming for growers, says Cornell Cooperative Extension’s Mario Miranda Sazo, an orchard management and mechanization specialist with CCE’s Lake Ontario Fruit Team, are continued whispers of potential U.S. ban on carbaryl. The carbamate insecticide has been outlawed in Europe since 2008. 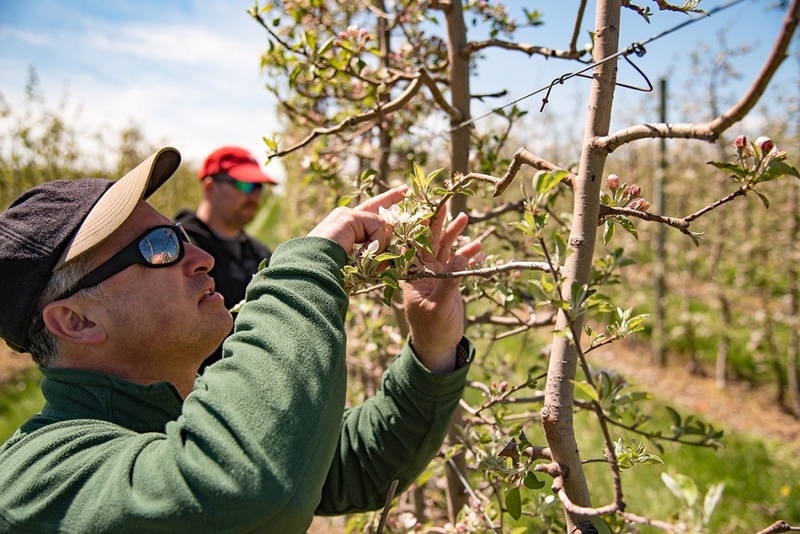 Cornell Cooperative Extension Orchard management and Mechanization Specialist Mario Miranda Sazo examines apple blossom prior during a mechanical string thinning study conducted at Lamont Fruit Farm in Waterport, New York. Photo by R.J. Anderson/Cornell Cooperative Extension. 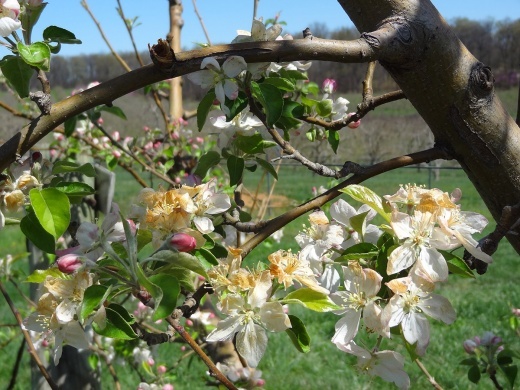 Such concerns prompted New York apple producers, CCE educators and Cornell researchers to team up for a recently completed three-year study examining a mechanical blossom-thinning alternative to carbaryl. Published in the winter 2016 issue of New York Fruit Quarterly, research led by Miranda Sazo and College of Agriculture and Life Sciences (CALS) scientists Poliana Francescatto, Terence Robinson and Jaume Lordan Sanahuja tested mechanical string thinning on Gala and Honeycrisp apple varieties at Lamont Fruit Farm in Waterport, New York. Mounted on the front of a tractor, the Darwin string thinner resembles a large weed whacker crossed with a feather duster. Featuring rotating flexible 2-foot-long injection-molded plastic spindles, the machine whips away a third to a half of a tree’s blossoms. What remain theoretically will grow into bigger, healthier fruit. For the project, Lamont Fruit Farms committed approximately 2.5 acres of mature Honeycrisp and Gala trees. Rod Farrow, one of the farm’s three owners, became intrigued by the technology after seeing it five years ago while visiting orchards in Europe. For Lamont Fruit Farms’ narrow fruit wall, in which trees are spaced two feet apart with 11 feet between rows, the optimal spindle speeds lie within a range of 180 and 200 rpm. The ideal tractor speed is 5 miles per hour. Still, the potential spread of fire blight, a disease that can spread quickly and significantly impact a farm’s entire harvest, has pushed Miranda Sazo to conduct more research. This past April, he partnered with Kerik Cox, CALS associate professor of plant pathology, on a one-year trial at the New York State Agricultural Experiment Station in Geneva, New York, aimed at assessing and minimizing the threat of fire blight following mechanical thinning. It is running concurrently with a similar study at Washington State University. 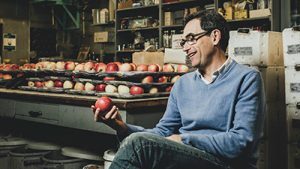 For more information about Peck’s work and the work of the Hard Cider Program Work Team (PWT) — a multi-disciplinary group of Cornell researchers, instructors, and extension educators and industry stakeholders — visit the Cornell Hard Cider Resources website. 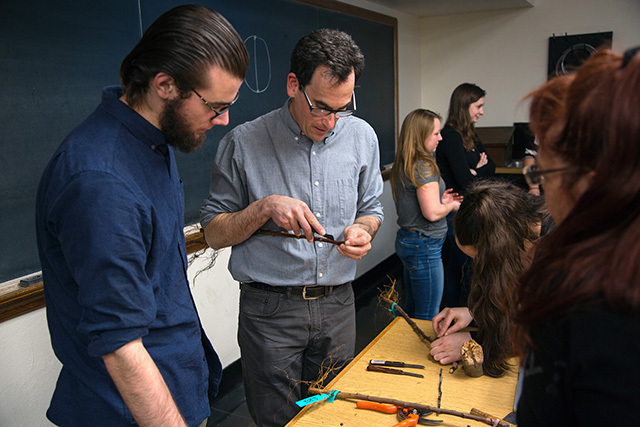 Peck teaches grafting to students in Ecological Orchard Management (PLHRT 4450). 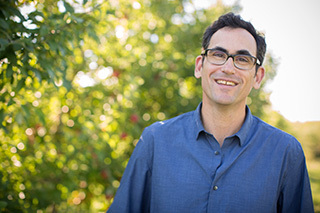 Two projects in Greg Peck’s Lab in the Horticulture Section of Cornell’s School of Integrative Plant Sciences received grants from the United States Association of Cider Makers. Horticulture graduate students, Adam Karl and Nathan Wojtyna, wrote the grants and will be leading projects on the effects of nitrogen fertilizer on orchard productivity and fruit and cider quality and phenotyping the USDA-PGRU collection for novel apples to use in cidermaking. Apple blossoms killed by a spring frost in 2012, after a long stretch of warm days. Photo by Gregory M. Peck/Provided. Through their phenological stages in warming weather, the apple trees develop silver tips, green tips, and then bloom. The Apple Freeze Risk tool shows minimum temperatures for the most recent 30 days, provides a 6-day temperature forecast, and shows the current stage of development in tree varieties. Apple trees are currently dormant, and only a sustained period of 25 below zero temperatures can damage this season’s crop. But as days warm, the buds’ tolerance for freezing lessens. One likely user of this new tool will be Mark Doyle, manager of Fishkill Farms in Hopewell Junction, New York, which grows apples, peaches, nectarines, currants, and cherries. He is concerned about early warm weather and freezing weather afterward, as he examines factors such as temperature inversions (warm air above cold air) and whether to employ either mechanical or thermal methods to heat the orchard on frigid nights.